Considering Bridge Work in Bastrop? Are You a Candidate for Dental Bridges in Bastrop, TX? If you have one or more missing teeth and still have teeth remaining on both sides of the open space, you are an excellent candidate for bridge work. Replacing missing teeth through this dental procedure as soon as possible is necessary for a number of reasons – primarily as prevention for future consequences of the gaps. Learn more about the specific dental work that will best meet your needs during a consultation with Dr. Byler about dental bridges in Bastrop, TX. An affixed bridge can be used to replace several teeth or a single one. The teeth on each side of the gap serve as anchors, or abutments, to support the ridge through the crowning procedure. These crowns are connected to the custom crafted replacement teeth to create a “bridge” and fill the open space. A dental bridge is by far one of the simplest and most effective methods of preserving the esthetics of your jaw and rejuvenating your smile. Bridges typically require 2 to 3 dental appoints from assessment to completion of the procedure. During a thorough examination, Dr. Byler and his team will study your X-rays and oral history to create a diagnostic model dictating the optimal method for taking care of your bridge work. After the evaluation is complete, your anchor teeth will be carefully reshaped to prepare them for the crowning procedure. Impressions of the entire area will be taken, and a temporary acrylic bridge will be crafted immediately. Temporary cement will hold your fixture in place while the permanent bridge is being crafted. The molding process typically takes 2-3 weeks to complete. 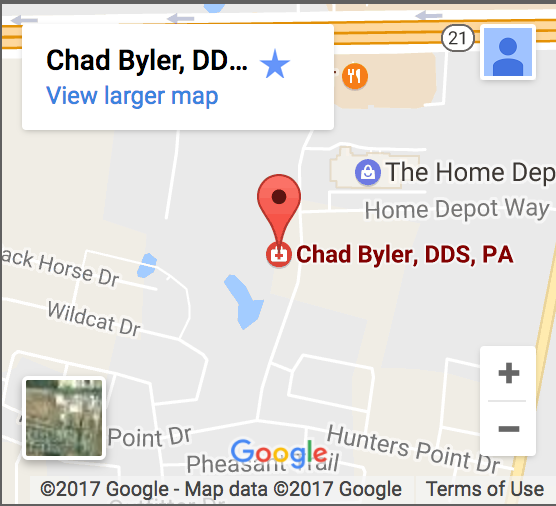 If you are seeking top-quality and affordable general or cosmetic dentistry in Bastrop or Central Texas, give the office of Chad Byler, DDS a call at (512) 308-9860. Take advantage of a dental bridges consultation, or schedule an exam and cleaning to enhance your evaluation.